Whenever we want to use service with the above components, we will have to inject the service name along with the component. By doing so, component ask angular to load that particular service in the application. This method of injecting service is called dependency injection. To know more about the complete collection of Service lists, please visit Complete lists of Services. How to use Service withComponents? To use a service, you will have to add it as a dependency with a component such as controller, filter or service. To add a service with component, you have to pass it as an argument. In the above example we injected our $service along with the controller. AngulaeJS provides many Built-in Services and Each service has individual functions and characteristics. The built-it services are prefixed by $ sign. AngularJS allows users to create their own Service. You can add any functions and behaviors to the custom service. In the factory method of creating service, we first create empty object of the factory then we assign properties and method to it and at last, we return the factory object. 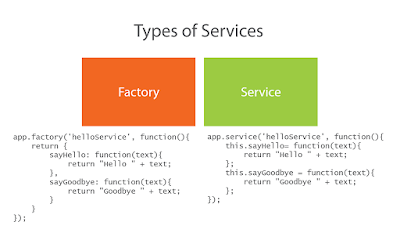 Below syntax is used to create service using factory method. We can also inject the above existing factory in to our service. I hope you got a cleared information about service and Factory. To know more about all other topics, please visit AngularJS Complete Topics.